About "Box and whisker plot"
Box and whisker-plot is the graph used in statistics to represent the central 50% of the values of a data set. The picture figure given below clearly illustrates this. 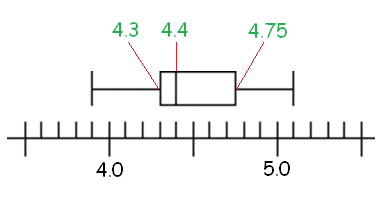 To draw box and whisker-plot graph for a data set, we have to know lower quartile, upper quartile and median. To construct box and whisker-plot for the given data set, we have to do the following steps. Using lower quartile, upper quartile and median, we have to construct box and whisker-plot as given in the above picture. Construct box and whisker-plot for the data given below. Using lower quartile, upper quartile and median, we can construct box and whisker-plot graph as given below. After having gone through the stuff given above, we hope that the students would have understood "Box and whisker-plot".